In 1994, the young publishing house Soltesz Reklam launched the first consumer electronics magazine in Hungary, Sztereó. In the early days, it only covered audio, but reader demand and the fast developing consumer industry meant widening the editorial concept. However, today it still mainly focuses on audio equipment and loudspeakers. In 1997, Sztereó magazine became a member of EISA’s Audio/Home Theater Panel. A year later, Sztereó joined EISA’s Video Panel too and started to test video recorders and TV sets on its pages. 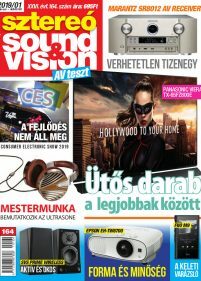 The magazine is for people interested in consumer electronics products and provides useful support in the planning of home entertainment, and also gives readers an opportunity to compare the whole range of audio and video products on the market. It offers news, reviews, tests, features, interviews, and some special reports about the most interesting events in the consumer electronics world. Sztereó’s readers are mostly males who like the latest technology products and have a big interest in the consumer electronics world.